HappyFox lets you create Private ticket where the ticket will not be visible to the contacts and can be accessed by the agents only. The customer will NOT be able to view the ticket from the contact panel. Email notifications will NOT be sent for tickets that have been created. How to create a Private ticket? To create a new ticket, click on the +New Ticket button. Enter the Subject of the ticket, the Message and enable Private ticket (visible only to agents). 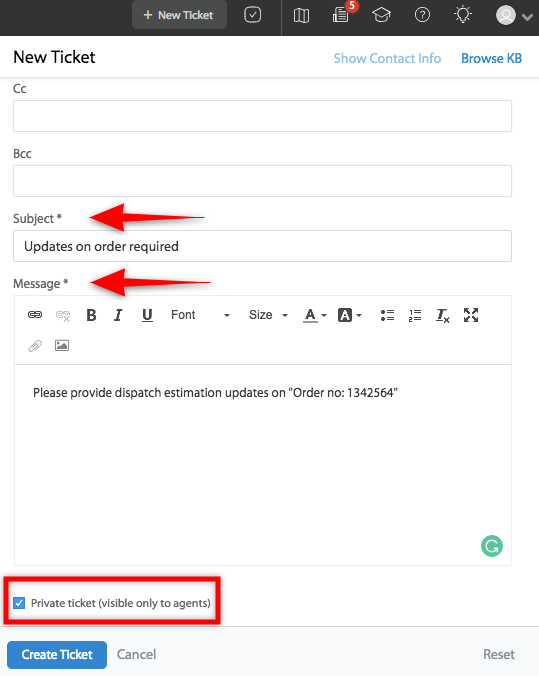 A Private ticket can be identified by a slashed eye symbol beside the subject line. How to Create tickets in Happyfox?